In a perfect world, marriages go on happily ever after. But in reality, I see heartbreak fairly often. From a Biblical perspective, what are we supposed to do with the pieces? The world says if our husband or wife is cheating, cut them off, make sure the children know you are hurt, and get everything you can in the settlement. In other words—make them pay. This verse is mistakenly taken to be Jesus’ decree that if adultery enters our marriage, we should automatically divorce. But this ignores (and takes out of context) the preceding verses where Jesus is explaining that divorce is the result of the hardness of our hearts. He also makes it clear that Moses, not He, made the allowance for divorce. In fact when Jesus states in verse 6 that the husband and wife are no longer two, but one flesh, and what God has joined together, let not man separate, is taken by most to mean that the separation comes when adultery enters. A close look at this passage does not support that conclusion. What Jesus is saying is that the separation should not take place if it is at all avoidable. Yes, there is an allowance if adultery is in the picture, but it is not an instruction to necessarily divorce. Looking at these verses in context, Jesus is saying that divorce is never His desired outcome, and separation comes when we separate, not when circumstances are right. That being said, I understand that there are men and women that were not given a choice in the matter. And an unrepentant spouse is an unrepentant spouse. 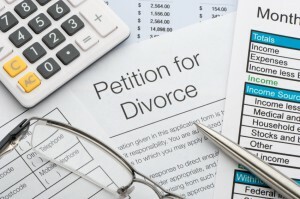 I know many individuals that are divorced, and ended up there completely against their will, in spite of their efforts to make their marriages work. The fact that they tried is not only admirable, it is Biblical. Throughout the course of history, we have seen many powerful, and once-respected individuals who fell into sin of some kind. The greatest tragedy, however, was their refusal to repent. King Saul was, at one time, God’s anointed king over His chosen people. But Saul fell into sin, and refused to repent. As a result, God replaced him with David. King David also fell into horrible sin, but when God confronted him with that sin, he humbled himself and sincerely repented. The sin still had permanent consequences, but David was restored to a right relationship with the Father. A spouse who is unrepentant needs prayer more than anything else. Pray for them, fight for them, do everything you can to restore them to you and to God. But if they refuse to repent of the sin they have brought into your marriage, you have done all you can do. As one of the most heart-breaking tasks imaginable, it is extremely difficult to battle sexual sin that has entered marriage. Ask God to sustain you, to deliver your spouse from this sin and restore your marriage. He or she does not have to listen, but if they do and repent, you have accomplished a great and noble thing.